The Mayor’s Office of Neighborhood Services is proud to announce the kick-off of Sunday Streets 2009! This year, Sunday Streets will open miles of neighborhood streets on Sunday morning for walking, biking and playing, helping to connect San Francisco neighborhoods. Six Sunday Streets events will be held this year in various neighborhoods in the City. Each event will host a variety of safe, free and fun activities that will attract families and individuals from our City and the entire Bay Area. 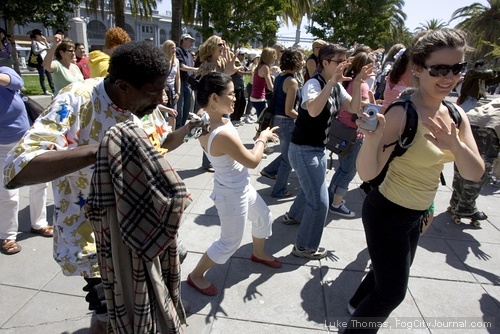 The first event will be held along the Embarcadero on Sunday April 26 from 9AM-1PM. This event will be held along the Embarcadero from AT&T Park to Aquatic Park. It will include free activities such as running of the bases in AT&T Park, a huge family fair at Aquatic Park, and free dance, yoga and kids classes along the route. 150 free bikes will also be available to use along the route, as well as a huge roller skating space (free skates included) at Justin Herman Plaza. Attached is a short one-page summary of Sunday Streets events, including event dates and locations. Please come out and enjoy these events, and also spread the word in your own communities about the events! Thank you very much and looking forward to seeing you on the Embarcadero on April 26! Sunday Streets’ success relies on having about 150 volunteers for each event. We are working with the San Francisco Bicycle Coalition to organize volunteers and it will be a fun and positive experience. If you’re interested (and I hope you are!) please let me know . You may also register to volunteer at: www.sundaystreetssf.com/volunteer.html. Comments for Sunday Streets San Francisco are now closed.